My interview with Gin Blossoms master guitarist Scott Johnson. Love the Gin Blossoms, and Scott's signature licks and sounds make it memorable for a lifetime to visit their older and newer exceptional rock! ----(Back up your data friends! My Ingrid Croce interview was lost to the archives. I love Jim Croce's music. it speaks to me. I feel his presence when I strum the chord progressions that he laid out more than 40 years ago. When I discovered Jim's music I embarked on a quest to discover more about this unappreciated master of songwriting. I loved his flair for character stories, his ability to create a mood, and his unbelievably insightful ballads. I had the privilege to speak with his widow Ingrid, who collaborated and traveled with Jim through his life and career. This is an interview that we recorded circa 2008. It is a treasured gem of mine to reflect on one of my favorite musicians of all time, Jim Croce, and to hopefully extend his talents and music to a new generation of listeners. I one day got the chance to visit Croce's Park West Restaurant in San Diego, California. I had the chance to thank Ingrid in person for the interview. She does so much to honor Jim's legacy, and it humbles me. Enjoy the interview everyone! (Audio uploading 8/17... while you wait enjoy "Spin, Spin, Spin" performed by Jim and Ingrid Croce. Given that the message is better than the recording, I do have to let myself enjoy the recording and producing process to keep it going. And honestly, the reception by email at dhxlive@gmail dot com has been awesome, around the world people have been listening and thanking me for all the free demos. So tonight I spent just under two hours drafting, playing, recording, and then producing (not fully, or autotune, or compressed, or perfect) - a demo, of a new song, called "Let Yourself Enjoy". Thanks for reading and listening, I do hope you will enjoy and share with your friends, who doesn't love free music? You can follow me @DannyHauger and @DHXmusic on Twitter. Subscribe to Danny Hauger Podcasts and get free music downloads from Danny Hauger every month! The idea is to keep yourself mindful. When you drift, you decrease the value of the present, which is the most important moment in your life. Enjoy the song! Thanks for listening! The introduction and talk about my new teaching career is available below. Like this song? Try one of my favorites for free also - Download "I Want You" from Danny Hauger feat. Gary Young(right click and save) - - > Its a beautiful acoustic ballad sung by Gary Young that I wrote and the recording is one of my most treasured and performed on stage. You can download both free right here on Danny Hauger Podcasts, and I hope you might help support my music as well. Support me on Amazon! You can support my music by buying the studio version of "I Want You" on iTunes and Amazon! 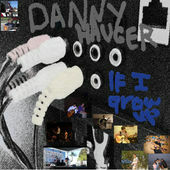 You can stream the album "If I Grow Up" by Danny Hauger on Spotify for free also! Need freelance work? Find me on Fiverr for voice overs, editing, narration, and more! Thanks to all the new friends, welcome! and thanks to all the returning fans! "If I Grow Up" is now live on Google Play for $5.99! "If I Grow Up" is available now also on iTunes ($10) and Amazon ($8). Its true, the transition to a full-time teaching roles has been underway all summer long here at Danny Hauger podcasts! This summer has been full of history reading in preparation for teaching, curriculum mapping, and classroom management policies. It is an exciting time. A time that has led to a lot of reflection, and an interior monologue to "Let Yourself Enjoy". My wife says my typing sounds like a drum solo.... I enjoyed that moment just now in real time. The next post you hear will be a full, free download version, of my new demo, Let Yourself Enjoy. Thanks for listening, please subscribe and come back often. Thanks to all the Danny Hauger music supporters in Northern Europe! I appreciate your words and reaching out with feedback! Cheers!